Mediaweek editor James Manning looks at last night’s TV ratings. 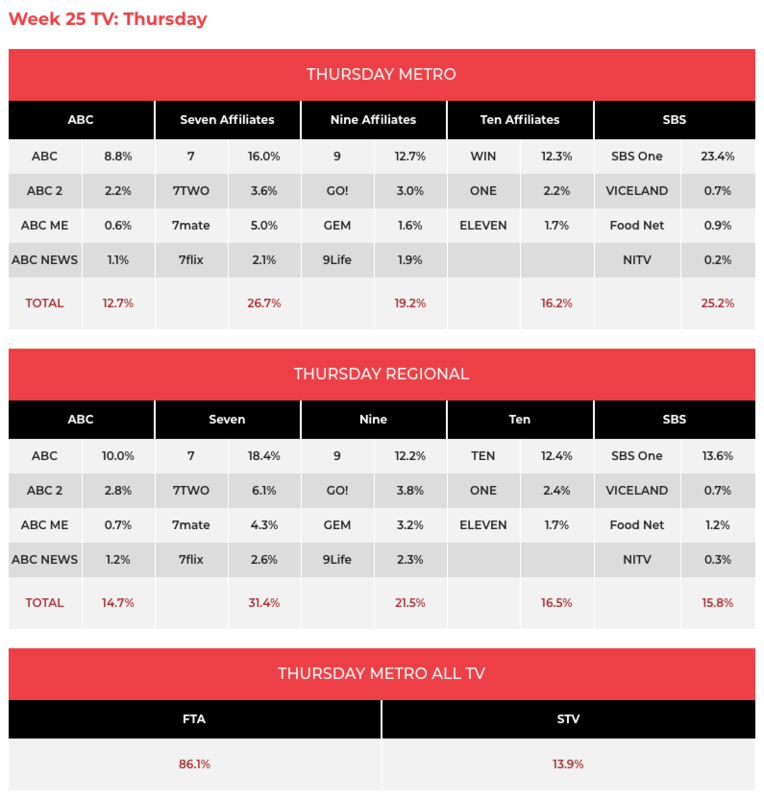 Home and Away ended the week with 601,000 from four markets after hovering around 700,000 for the rest of the week. Live AFL then took over on Seven in southern capitals and on 7mate in Sydney and Brisbane. 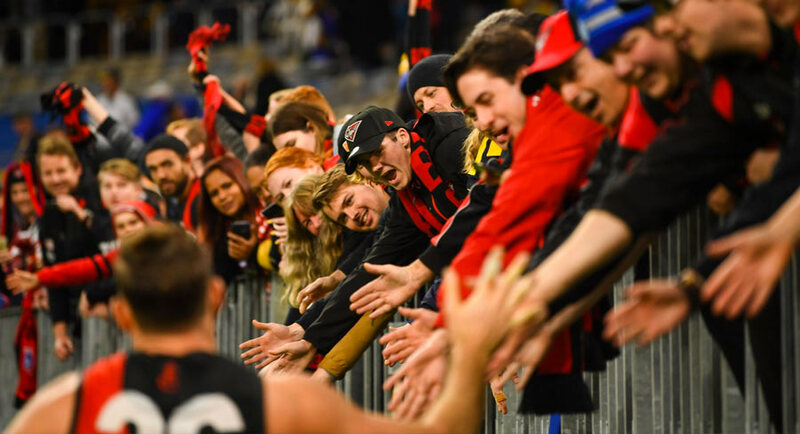 The one-sided match saw 510,000 watching Essendon surprise the Eagles. A Current Affair did 748,000 as the program updated its Wednesday greedy bank story before reporter Dan Nolan had news on the ACA Solar Power giveaway and how much the winners had saved in electricity costs over the summer. No Thursday night NRL because of Sunday’s State Of Origin (and don’t forget the women’s game tonight). Nine went with RBT at 7.30pm with 540,000 watching. 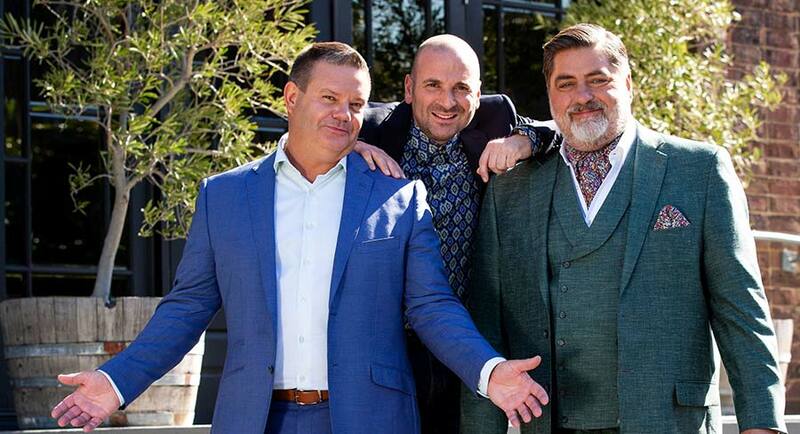 The Footy Show got an early timeslot in Sydney (85,000) and Brisbane (52,000). Guy Pearce was a guest on The Project with 515,000 watching. He was plugging his new music, and not the great new series of Jack Irish starting soonish on ABC. MasterChef had an elimination challenge with six people wearing black. It came down to Ben and Aldo, with the big Italian due to be sent home. He was saved, temporarily it turned out, by a challenge featuring all previously eliminated contestants to allow one back in the competition. Young and talented Brendan Pang made it back in, narrowly beating Lisa. The series ended the week on 796,000 after 788,000 a week ago. Todd Sampson’s Body Hack 2.0 then did 430,000. 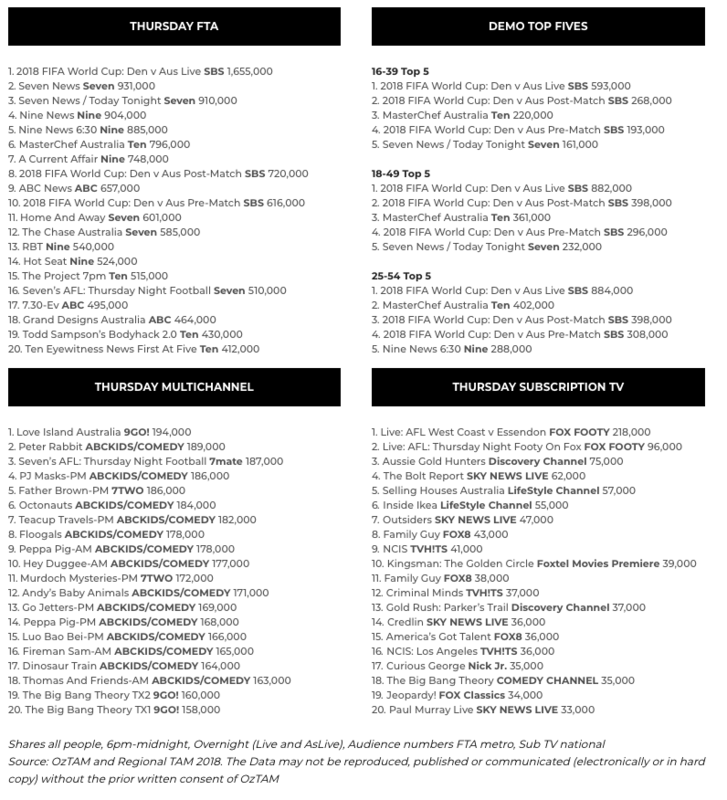 Grand Designs Australia did 464,000 followed by QI on 290,000 and then Victoria on 165,000. Repeats of the UK historical drama have replaced Foxtel’s Wentworth in the Thursday timeslot. 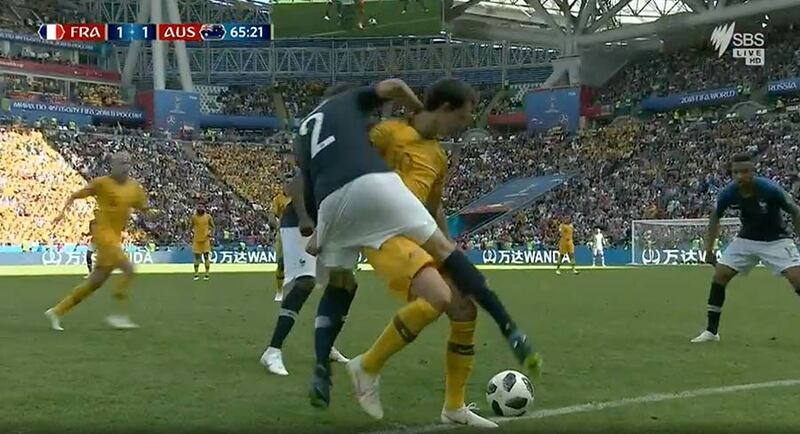 The Socceroos’ second FIFA World Cup match did 1.65m for the 10pm kick-off against Denmark. 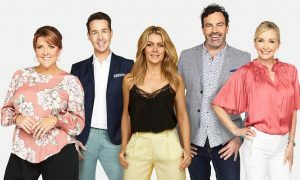 The win gave SBS its second primary channel winning share in six days after also finishing in first place last Saturday with the Australia v France match. 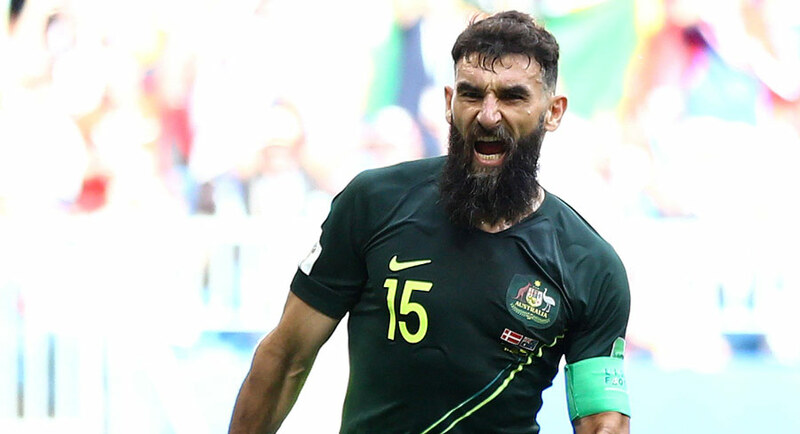 • World Cup TV ratings: After Saturday record – what’s next for SBS? Next up is the important Australia v Peru game at the not-so-friendly timeslot of 12am Wednesday. Meanwhile the audience watching the first half of France v Peru at 1am was 191,000. The channel’s best non-sport audience last night was 251,000 watching Great British Railway Journeys. Get daily TV ratings and analysis sent straight to your inbox with the Mediaweek Morning Report. Subscribe free here.